I took the 25 different inferred clusters from my recent ChromoPainter analysis, and calculated their normalized median components in terms of the K12b calculator. This is a quite useful exercise, since it can show in what sense clusters are different from each other. Here are two ways in which you may use this correspondence. Or, there is a group of 5 Iranians that belong to pop12, whereas the overwhelming majority of Iranians and Kurds belong to pop21. Strikingly, pop12 differs from all other populations in having substantial levels of East_African and Sub_Saharan. So, it seems that fineSTRUCTURE was able to infer that some Iranian individuals had this feature in common. 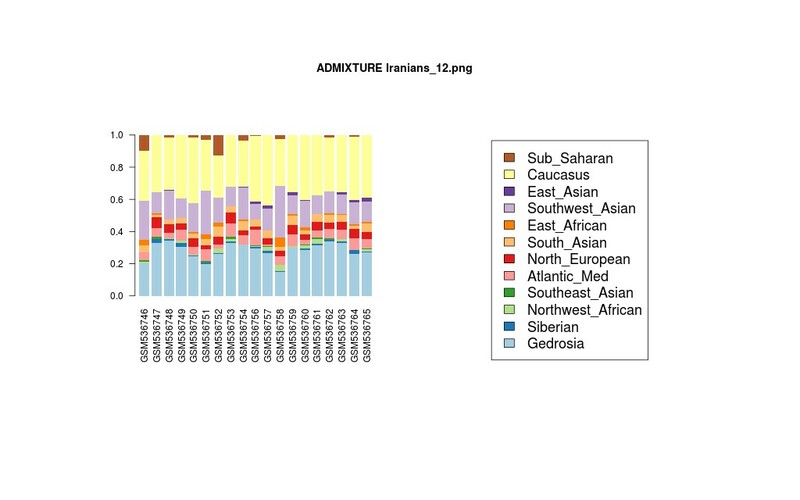 These individuals were already evident in the Iranian population portrait (right), but fineSTRUCTURE was able to group them even though there were no African populations in the ChromoPainter analysis; presumably, the software was able to detect that these individuals shared a set of chunks that were quite different than is the norm for the Balkan/West Asian area. fineSTRUCTURE grouped the different populations in a tree structure. For example, it grouped pop18, the "North Balkan" cluster with pop23, the "Bulgarian-Romanian" one. 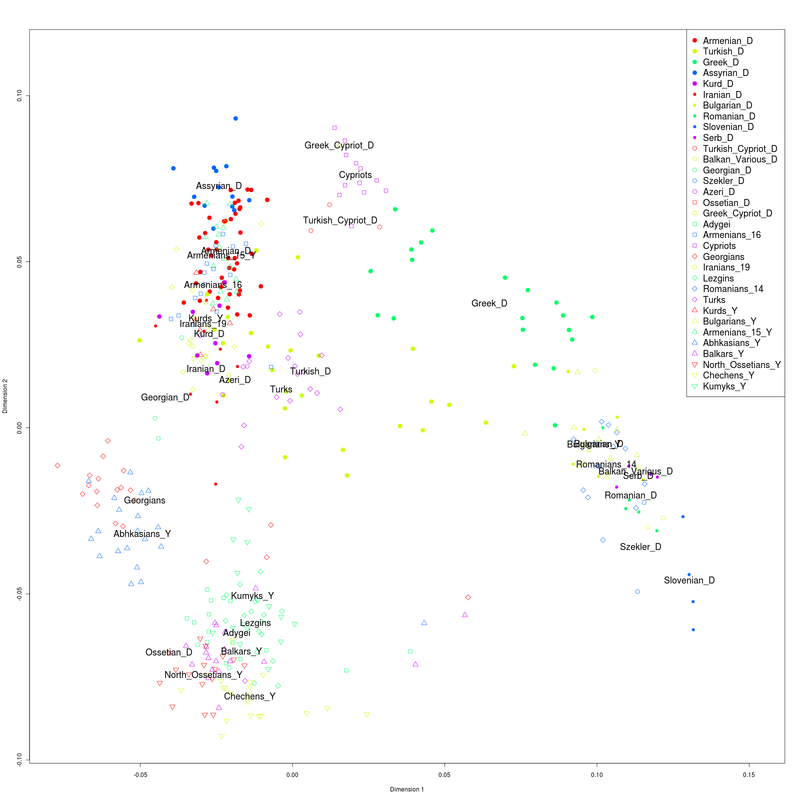 Looking at the admixture proportions, we can tell that the two clusters do indeed seem quite similar, but there are some differences, e.g., an excess of North_European in pop18, and an excess of Caucasus in pop23. 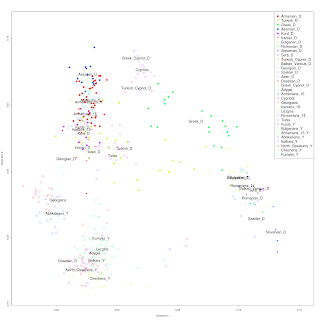 This makes sense given the geographical origin of individuals belonging to the two clusters. I have carried out a ChromoPainter/fineSTRUCTURE analysis of Balkans/West Asia. This is a slightly different dataset than the one used in the previous fastIBD analysis of the same region. It also took much longer (about a week, with two CPUs dedicated to the task) to complete, so it is not something that can be done routinely. 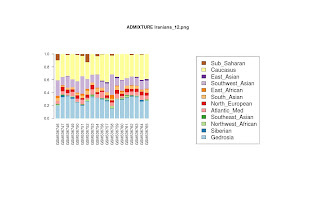 413 individuals from 33 populations were studied, on 258,100 SNPs, after --geno 0.03 --maf 0.01 filters were applied. Data were phased in Beagle with the default 10 iterations. Genetic maps from the HapMap were used. fineSTRUCTURE was used on ChromoPainter output, with 500,000 burnin/runtime iterations each. 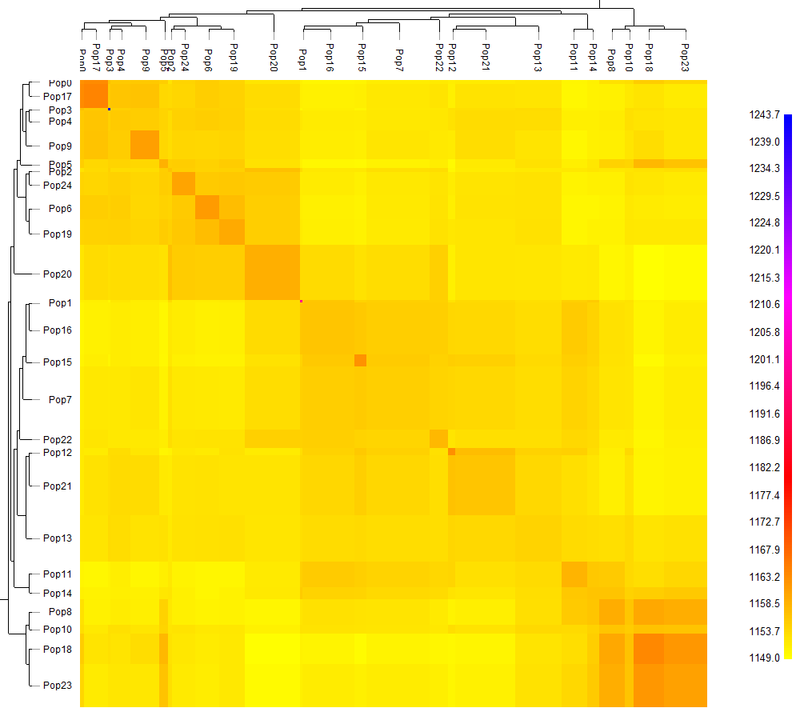 fineSTRUCTURE imposes a tree structure on a number of inferred populations. 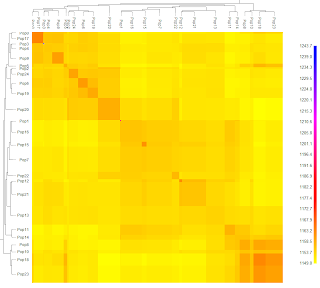 The following heatmap shows this tree structure; columns represent donor populations, rows, recipient ones. There was a total of 25 populations, labeled pop0, pop1, ..., pop24. pop14 is also Greek, and includes a variety of people with ancestry from Crete, the Aegean, Cyprus, Asia Minor, Cappadocia, and the Pontus as well as continental Greek. It could be labeled "eastern Greek"
pop10 is Turkish, and includes people with some ancestry from the Balkans, as well as Anatolia. It could be labelled "Balkan Turkish"
pop22 could be labeled "Northeastern Anatolia" or (more classically) "Pontus-Colchis". It appears to unite various individuals from Northeastern Turkey and neighboring Georgia, having Karadeniz Turkish, Armenian, Pontic Greek, and Kartvelian ancestry. I strongly encourage participants from this region to join the Project, especially Pontic Greeks, as there are no 100% Pontic Greeks currently in the Project. pop23 is "Bulgarian-Romanian" mainly, and also includes one Serb. Once again, I emphasize that the power of this approach using haplotypes depends on participation, so I encourage all people from the Balkans to consider joining the Project. Results for Project participants are included in the spreadsheet. 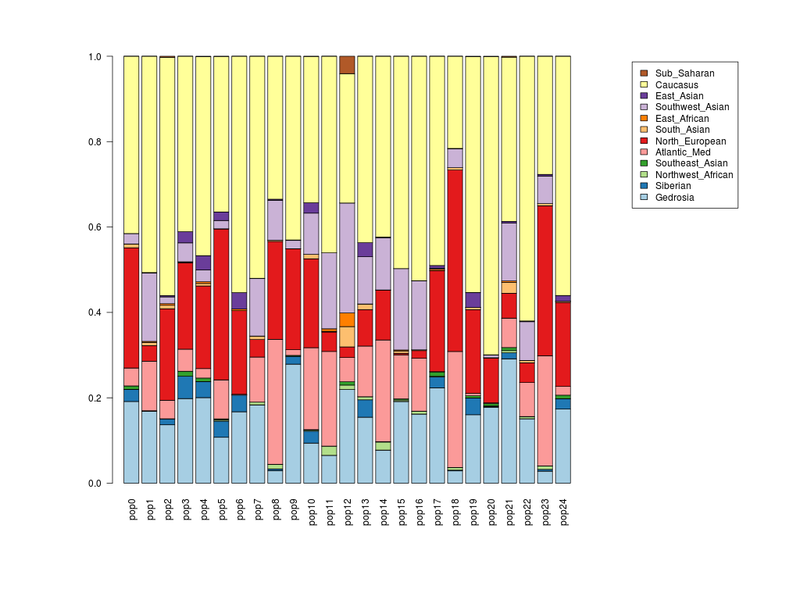 Z score population matrix, shows the normalized number of "chunks" from each donor population (columns) to each recipient (row). Do not compare across rows! The way to read this table is the following: for each row, higher values indicate more sharing. For example, the "Cypriots" population has pop11 as its main donor. Averaged results were included only for populations with >=5 members. The raw chunkcounts for all 413x413 individuals can be found here. The Dodecad Project is not affiliated with any genetic testing companies. Until now, I have included Project participants from 23andMe and FamilyTreeDNA "Family Finder" tests, but it has come to my attention that there are new players in the field, such as Ancestry.com (see post on Your Genetic Genealogist) and Lumigenix (see post on GenomesUnzipped). If you have data from any company entering this field, please contact me at dodecad@gmail.com (do not send data right away!). That way, I can find out how many markers are in common between the new tests and my existing datasets, and figure out how easy it will be to convert them for use in the Project and in DIYDodecad.